The first-of-its-kind 10,000 mile Pet Safety Tour will roll across the Southern U.S. this Fall with award-winning author and Pet First-Aid instructor turned Pet Safety Crusader™ behind the wheel! Denise Fleck’s Sunny-dog Ink motto has been “Helping people to help their pets,” and she has…having personally taught more than 10,000 pet lovers animal life-saving skills and millions more on national television segments (CBS-TV’s “The Doctors,” Kirstie Alley’s Big Life,” Animal Planet’s “Pit Boss” and “Groomer Has It,” CNN Headline News and pet safety segment on KTLA in Los Angeles). Still, Fleck feels many more dogs and cats could benefit from their humans receiving better pet parenting education. 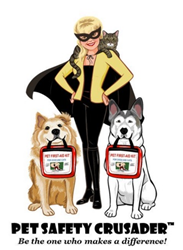 “In my 2016 role as Pet Safety Crusader™, I plan to educate a large number of people in one concerted effort!” she explains. Pet First-Aid & CPR classes will be taught at animal shelters that haven’t had the benefits of larger city educational opportunities. Fleck will also provide Pet First-Aid Kits to Therapy Dog Handlers, teach Pet Disaster Preparedness at Fire Stations to emergency response volunteers and read children’s books at school at libraries, all aimed at educating people to better care for the family pet and never judge an animal based on age, fur color or breed. nearly 7,000 independent professional pet-sitting businesses in the United States, Canada and abroad. The 2016 Southern U.S. Pet Safety Tour will kick-off its journey on September 15th, departing from the PSI World Education Conference in San Diego, California. Several PSI members will serve as event coordinators in cities where the Tour will make educational “whistle stops.” To-date, events are being planned in Phoenix, AZ; Dallas, TX; Baton Rouge, LA; Jackson, MS; Mobile, AL; Sarasota & Ft. Lauderdale, FL; Atlanta, GA; Winston-Salem, NC; Winchester, VA; La Plata, MD; Clarksville & Nashville, TN and Camden, AK with other cities still coming on board. Denise Fleck also created the curriculum for and teaches a 20-week course in Animal Care through the Burbank Unified School District for high school juniors and seniors at the Burbank Animal Shelter. “As the proud instructor, I hope one of my students will cure a debilitating canine disease or end animal homelessness, but if each student adopts a shelter pet (particularly a Senior), shares with friends the need for spay/neuter or never harms or judges a dog by his breed alone, I’ll still wag my tail,” she smiles. Fleck resides in Southern California with her husband and their pack of rescued Japanese Akitas. Learn more at http://www.SunnyDogInk.com. Established in 1994 by Patti J. Moran, author of Pet Sitting for Profit, Pet Sitters International (PSI) is the world’s largest educational association for professional pet sitters, representing nearly 7,000 independent professional pet-sitting businesses in the United States, Canada and abroad. PSI provides members with access to group-rate pet-sitter liability insurance and bonding and educational resources including a comprehensive certificate program, Pet Sitter’s World magazine and PSI’s annual Pet Sitter World Educational Conference. For pet owners, PSI offers the Official Pet Sitter Locator, which pet owners can search free of charge to find a local pet sitter. For more information, please visit http://www.petsit.com.